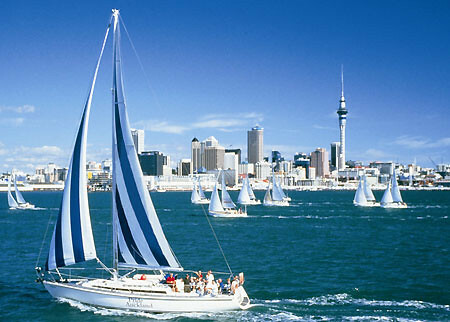 Auckland is the largest and most populous city in New Zealand, situated in the country’s North Island. Known as the “City of Sails”, Auckland, lies on an isthmus and has the largest population of Polynesians than any city in the world. Two harbours surround the isthmus. It is in a very volcanic area with as many as 50 volcanoes that are shaped like cones, lakes, lagoons, islands and depressions. The city has around 14 lava caves which run towards the sea. Sailing is very popular in the city which lies on a harbour. Auckland has an oceanic/temperate climate with warm humid summers and mild damp winters. More than 100.000 yachts and launches are registered there and one of the most famous sailboat races in the world the Americas Cup takes place in New Zealand. The city has a number of interesting sites, including Prince Albert Park as well as Sky Tower which is the tallest free-standing structure in the southern hemisphere. The Vector Arena is in downtown Auckland and getting around the North Island is made simple with a local train which is based at Britomart Station. The Auckland International Airport is around half an hour from downtown Auckland.